Last week I ordered an Amazon.com Kindle e-book reader for myself, and I have to say, I’m really liking it. I have been holding out for an Android tablet, but after checking one out in-store, I realized I needed a smaller, lighter, and glare-free device with far better battery life. I ultimately ordered the wi-fi version for myself, and after showing it to my parents over the weekend, I was given the go-ahead to order one for them too. 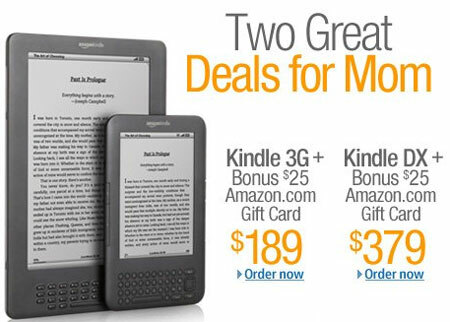 When I went to place the order, I saw that Amazon is offering a pretty good deal – buy a 3G Kindle for $189, and they throw in a free $25 Amazon gift card. The deal ends 11:59pm on Mothers Day (5/8/11), although the terms and conditions say that Amazon can cancel the promo at any time (which they probably won’t).